Contact is a versatile, seven-piece new music ensemble based on Toronto, Canada. Founded by percussionist/composer Jerry Pergolesi, who also acts as musical director, the group has the outward appearance of a chamber orchestra, but the inner motivation and skill to cross genres and disciplines at will. Run almost like a rock band, the group draws on avant-garde and experimental art music, improvisation, conceptualism and more. Two recent releases show their fluency in different dialects of contemporary music. A Gossamer Bit, issued in 2015, features four works by contemporary Canadian composer Allison Cameron. The four pieces are what might be called refigurative works—works that refigure, through adaptation, rewriting or chance reordering, formal or pitch material derived from pre-existing works, whether by Cameron or by others. They also incorporate a good deal of improvisation since, while their forms are fixed at the global level, they may call on performers to exercise a high degree of choice at the local level. For example D.I.Y. Fly, a piece based on the standard Fly Me to the Moon, has the performers play through multiple charts of the song in two different time signatures, each playing at his or her own pace. As a fragmented rhythm section, the guitar and bass maintain the structural integrity of the chord progression, even if only by rumor; at the same time the melody—recast as elongated tones–dissolves into free-floating planes of expansive notes. In Memoriam Robert Ashley refigures Ashley’s graphic score In Memoriam Esteban Gomez by appropriating the earlier work’s structure while changing its component elements. The order of events is specified, as are the pitch sets that make up their content, but the details of the realization—duration, phrasing, articulation, tempo and pitch set sequence—are left up to the performers. Given the instructions, the composition licenses multiple approaches; the pitch material conceivably can be realized as points, planes, or lines. No two performances will sound alike, particularly in terms of textural density. 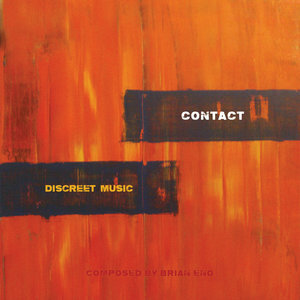 Contact’s realization for this recording is planar and elegiac, couched in somber, long tones intersecting in slow harmonic rhythm. Moving from the improvised to the defined, Discreet Music is Contact, supplemented by guests on flute and gongs, playing Pergolesi’s arrangement of the Brian Eno ambient classic. Pergolesi was inspired by the Bang on a Can arrangement of Eno’s Music for Airports; it not only set the precedent of reworking Eno’s electronic ambient music for an acoustic chamber group, but “gave permission” to do so, as he puts it. Originally a work for looped tapes, Discreet Music is here orchestrated for winds, strings and percussion. Surprisingly, the timbres of the acoustic chamber ensemble evoke the timbres of the original piece. But the overall effect of the piece undergoes a subtle shift. Both by rearranging Eno’s two melodic lines as seven lines and pushing to the foreground music that originally was as happily enough ignored as listened to, Pergolesi brings out its harmonically unsettling ambiguity. Although individually bland, the motifs that make up the piece conflate tonic and dominant when overlapped and summed, leaving an odd tension that this arrangement brings into focus—call it the hidden drama of resolution deferred. Both Discreet Music and A Gossamer Bit give evidence of a group tracing an imaginative path through the labyrinth of possibilities open to contemporary music.